Government Polytechnic Jammu is one of the oldest Diploma Engineering Institute of the country. The Institution received Centre of Excellence award in 1999. Since inception in 1960 till date, courses related to market/industrial need are added from time to time. Above all, the teaching-learning process is the main aim of the Institution. It is here where young innocent minds are groomed, nurtured and given a shape that lasts throughout the end of an individual's life. 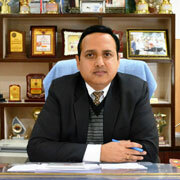 The traditional concept of educational institutions, imparting knowledge has paved way to the modern concept of institutions being responsible for not only imparting knowledge but also find ways and means for utilization of that knowledge for the overall well being and benefit of the society, the nation and humanity at large. Copyright © Government Polytechnic College, Jammu, J&K. All Rights Reserved.